Exactly a year ago, Qualcomm ventured into the PC space by announcing Snapdragon 835-powered laptops, and a few months later, launched the Snapdragon 850 platform for laptops. And now, at the third annual Snapdragon Tech Summit 2018, the San Diego-based chipmaker has just made the Snapdragon 8cx Compute platform official. 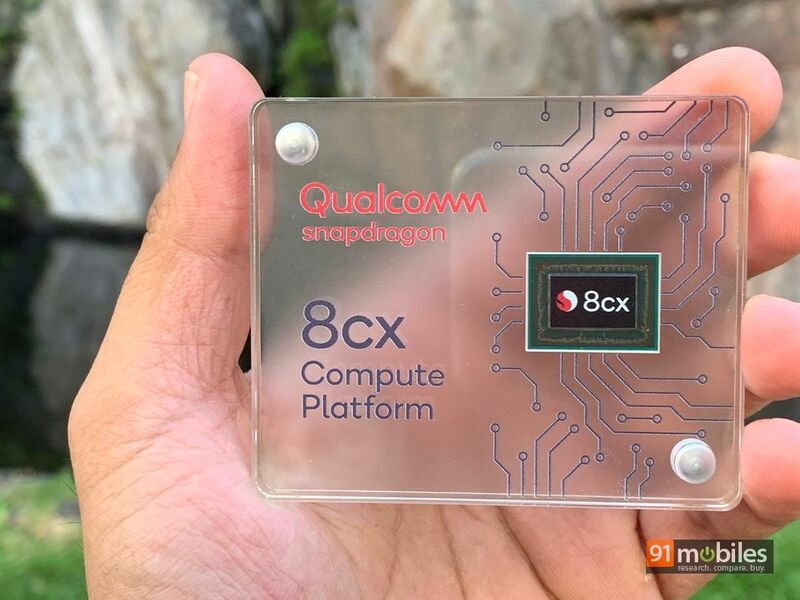 Designed from the ground up for mobile computing on laptops, the 8cx is said to be “the most extreme Snapdragon ever created”, with the ‘x’ in its moniker standing for ‘extreme’. Promising “extreme performance, extreme battery life and extreme connectivity”, the premise of this new chipset is essentially the same as the SD 850 SoC and what the company promised with the SD 835-powered laptops. In a nutshell, these promises include an always-on, always-connected user experience, multi-day battery life on a single charge, along with sleek and innovative form factors… all running Windows 10. 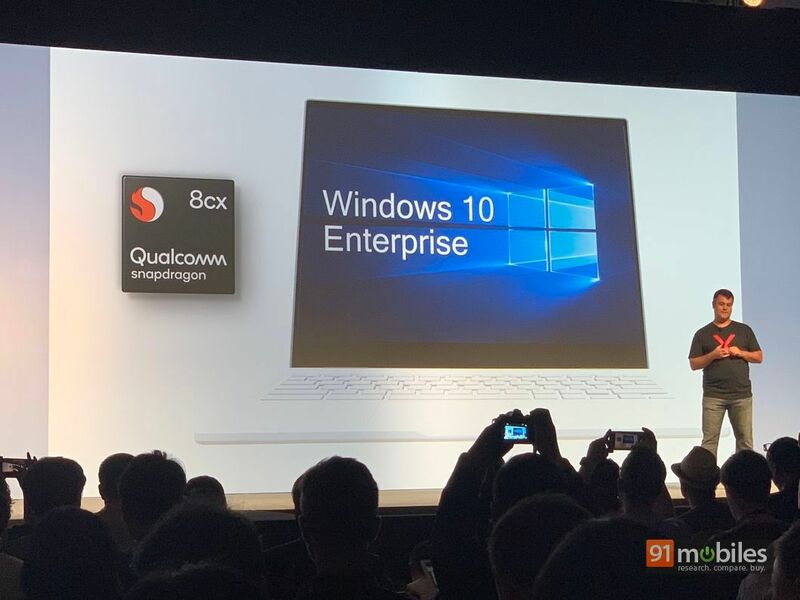 The Snapdragon 8cx is the first 7nm platform for the PC. In fact, Qualcomm has just officially made the leap to the 7nm fabrication process with the recently-announced Snapdragon 855. However, the 8cx platform is said to be even more powerful than the 855 SoC, which is designed for the mobile. 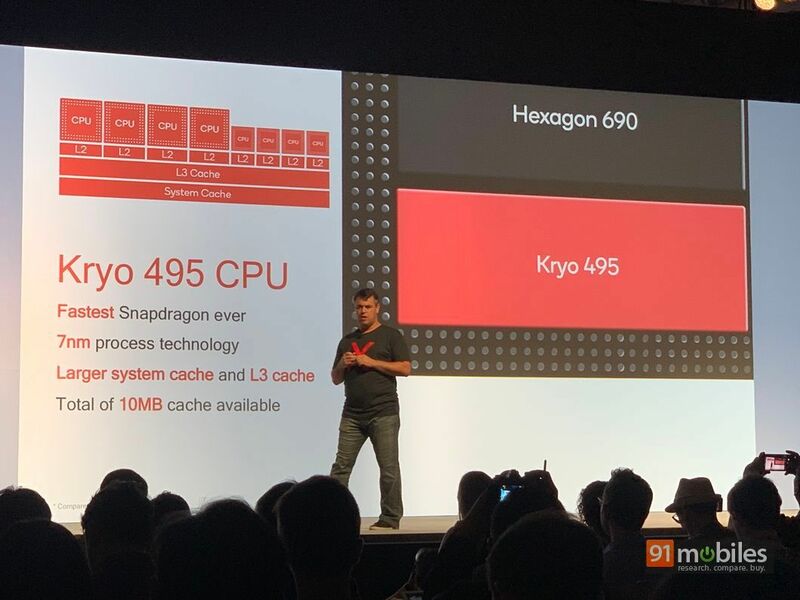 One of the key components of the new Snapdragon 8cx SoC is the Kryo 495 CPU, which is an octa-core chip utilising A76 prime cores for speedy performance. On offer is larger system cache for better multi-tasking, with Qualcomm claiming up to 2X faster sustained performance as compared to its closest rival. The accompanying Adreno 680 GPU is said to to be 2X faster than the previous generation, and 3.5X faster than the Snapdragon 835, apart from being 60 percent more power efficient in comparison to the SD 850. The new GPU doubles the memory interface from 64-bit to 128-bit, and supports second-gen HDR playback. Snapdragon 8cx-powered devices can be hooked up to two 4K HDR external monitors. 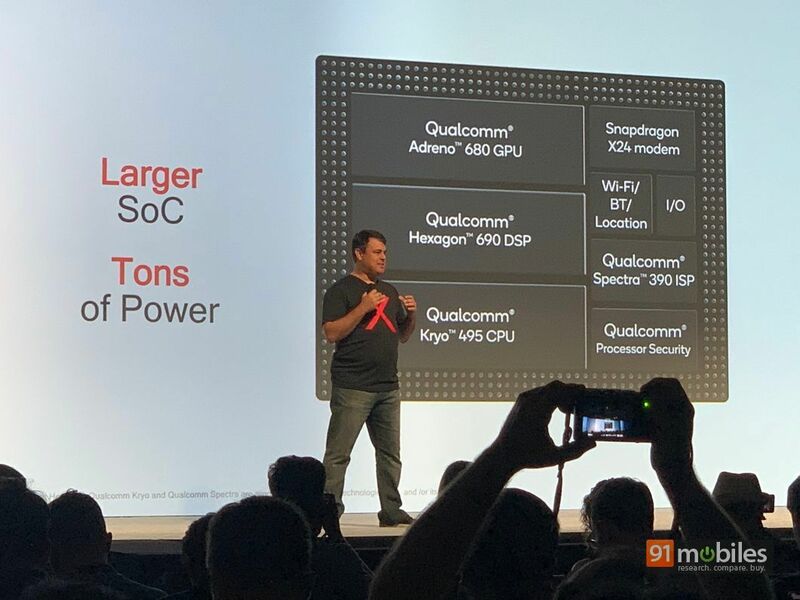 As far as connectivity is concerned, the Snapdragon 8cx SoC will come with the X24 LTE modem, that promises up to 2 Gbps download speeds. 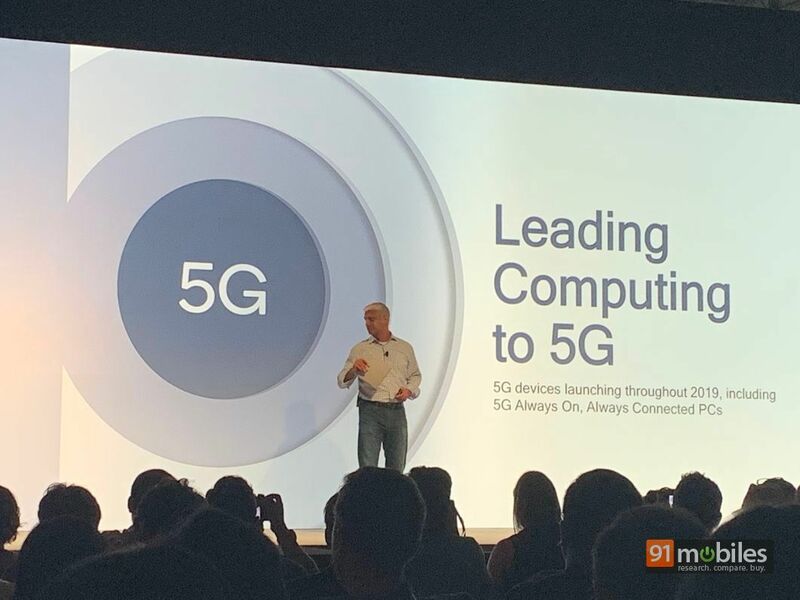 Qualcomm has even promised 5G support in the future, though it remains to be seen if the company will use its X50 5G modem for this purpose. What makes things really interesting is the fact that the Snapdragon 8cx platform supports Quick Charge 4.0 as well. This means that the users not only get the promise of insane, multi-day battery life, but can also juice up their Sd 8cx-powered devices really quickly when they need to. The other goodies include support for smart assistants like Amazon Alexa and Cortana, plus support for Windows 10 Enterprise. The latter is an interesting proposition as well, as this makes Snapdragon 8cx-powered laptops ideal for companies wishing to equip their workforce with devices that can increase productivity. In that sense, the 8cx is likely to be key in helping developing next-gen road warriors, who are connected all the time, have enough power at their disposal to handle various kinds of computing tasks, and don’t need to waste time tethered to a power socket, all thanks to the long battery life. As far as availability is concerned, the Snapdragon 8cx SoC is expected to begin shipping in commercial device in Q3 2019. Unfortunately, Qualcomm hasn’t announced the names of any hardware OEMs who will be manufacturing these machines, or showcased any commercial devices at the Tech Summit. However, on the sidelines of the event, Miguel Nunes, Senior Director of Product Management for Qualcomm, told us that the company is in talks with various local brands in emerging markets like India to come up with devices based on the new Snapdragon 8cx platform, across different price brackets. He said that collaborating with new, local hardware partners is important for Qualcomm to increase scale and availability, given that most tier-1 manufacturers usually tend to roll out new devices in more mature markets. So hopefully, we should see some Snapdragon 8cx-based laptops landing in India as well… though it looks like it’s going to be a long wait.